Air pollution potential (APP) is a measure of the meteorological conditions conducive to high air pollution levels, independent of source emissions. 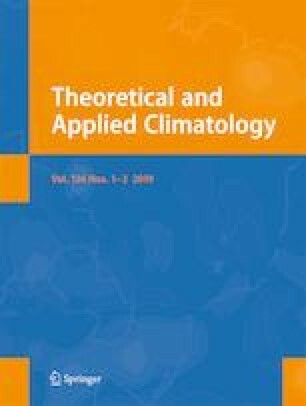 We propose the integrated concentration footprint (ICF) as a new indicator to quantify APP and present the climatology of the APP distribution in China. The HYSPLIT model was employed to calculate back trajectories and to derive ICF at grid points over China, for the period 2000–2012. The annual mean APP exhibited a distribution in reasonable agreement with topography and climate features. Seasonal characteristics of APP are also presented. Comparison of the seasonal variation in APP with that of air pollution data at selected cities produced diverse results. APP agreed well with air pollution variations in Urumqi, a city in northwestern China. However, in eastern China, APP peaked in summer, which is in contrast to observations, where the lowest air pollution levels occurred in this season. Two possible factors were considered to resolve this discrepancy, namely, the scarcity of pollutant sources over the sea surface and the wet removal of particulate matter. Adjusted APP exhibited an inland shift of its maximum in southeastern China and reduced values in summer, which were in more reasonable agreement with air pollution data. The correlations between adjusted APP values and air pollution levels were significantly improved in the southern coastal cities of Guangzhou and Shanghai, but could not adequately capture the observations for other inland cities. Although preliminary, the ICF provides a comprehensive measure of the meteorological background of China’s air pollution. The online version of this article ( https://doi.org/10.1007/s00704-018-2511-8) contains supplementary material, which is available to authorized users. This work was partially supported by the Clean Air Research Project in China (201509001, 201409001), National S&T Support Program (2014BAC06B02), and National Natural Science Foundation of China (41421064, 41575007).